In Dave Brailsford's recent Radio 5 interview he suggested that the key to defending the Green Jersey won by Mark Cavendish last year whilst simultaneously pursuing the Yellow Jersey for Bradley Wiggins would be in packing the team out with super-strong domestiques. Marvellous. Glad he thought of that. So simple. We all know it won't be that easy. The last team to successfully pursue yellow and green was Deutsche Telekom, who managed the feat in 1996 and 1997, with Erik Zabel taking the first two of his six Green Jerseys, while Bjarne Riis and Jan Ullrich both captured their sole Yellow Jerseys. Deutsche Telekom could draw on an admirable selection of super super tough domestiques, including Rolf Aldag, Brian Holm and Udo Bolts. Cavendish knows Aldag, Holm and Zabel well, having worked with them as directeur sportifs at HTC. While they undoubtedly contributed a great deal of experience and tactical savvy to the Manxman's tally of victories, one ingredient from the Telekom team that they've always tried to leave behind is EPO. I'm not being snide here. I've said plenty of times that pre-Festina doping and post-Festina doping seem like very different things to me. The point is, packing a team full of domestiques capable of leading out sprints through the first week and towing leaders over mountains in the second and third isn't really as practical as it used to be in the bad old days of proper preparation. There is a simple and practical solution, however. One that we all know, but which no one will dare say out loud: don't chase the Green Jersey. 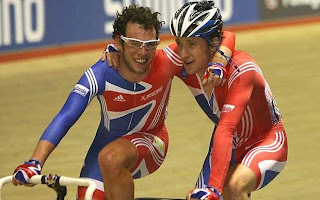 I love Cavendish to bits; he's made the first week of the Tour worth watching again, but he's only 26. In all likelihood, he's got at least four more years before his powers even begin to fade, and as Zabel showed, canny racing can still bag you points jerseys even after you stop being as powerfully and repeatably explosive as you once were. Wiggins, on the other hand, is 31. He hasn't got many chances left. More importantly, how often in the last ten years have you seen a Grand Tour route with over 90K of Time Trialling in it? When Team GB saw how well suited to Cavendish this year's Worlds route was, they agreed to put aside all individual ambitions and ride for Cav. Team Sky need to apply the same logic to the Tour. The route suits Wiggins, and he'll never have a better chance to win the biggest prize in cycling. The team needs to be entirely and completely focussed on working for Bradley. For one season, Cav needs to put his Tour ambitions aside. The team can build his program around the Giro or the Vuelta, or he could chase Milan-San Remo, Ghent-Wevelgem and Paris-Tours. He'll have plenty of opportunities to chase the Green Jersey in years to come, but I'd hate to see Wiggins lose his best shot at the Tour because Dave Brailsford thinks he can split the efforts of a clean team the way it used to be possible to split the efforts of an 'enhanced' squad.